A FREE CNC Training DVD is included with every Mill control AND Expert on-site CNC training is available. We train you how to setup, program and operate your newly retrofitted machine. Expert on-site CNC training is available Worldwide. 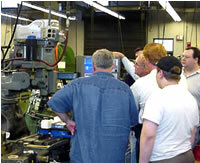 We train you how to setup, program and operate your newly retrofitted machine. The training is in depth and is tailored to your application. We make sure you are a success. The ease of use of the Centroid CNC reduces the CNC learning curve to just hours. Typically one 8 hour training is all that is needed. Even on the first day of training you will be making chips before lunch time. 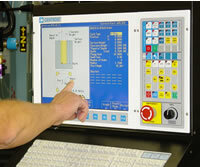 A free CNC Training DVD is included with every Mill control as well. We take you from print to part! First day CNC trainings cover setting up tools in the tool library, setting part zeros positions of fixtures and vises, programming with "Intercon" Conversational, graphing the finished G code program, and running the job. Useful subjects such as: "Stopping and restarting the job" (to clean off or replace a tool) and "How to properly use cutter compensation" are covered as well. Sometimes a "Booster" training is performed about 4 to 8 weeks after the initial startup training. This booster training often will address such questions as "How do I do this faster?" "How do I do this better?" Booster trainings can range from a full day of additional training to just a few hours and are varied depending on your needs.